Dante is a young man who is just living his life to the fullest occasionally having to fight demons. He is contacted by a young woman named Kat who reveals that Dante is a key person in dealing with the demons who are manipulating humanity. Dante who memories were erased remembers his heritage as the son of a demon and an angel and that he has a twin brother. Vergil was the one who ordered to find Dante and who is leading the organization who has been fighting against Mundas the demon who is responsible for the manipulation and tearing their family apart. 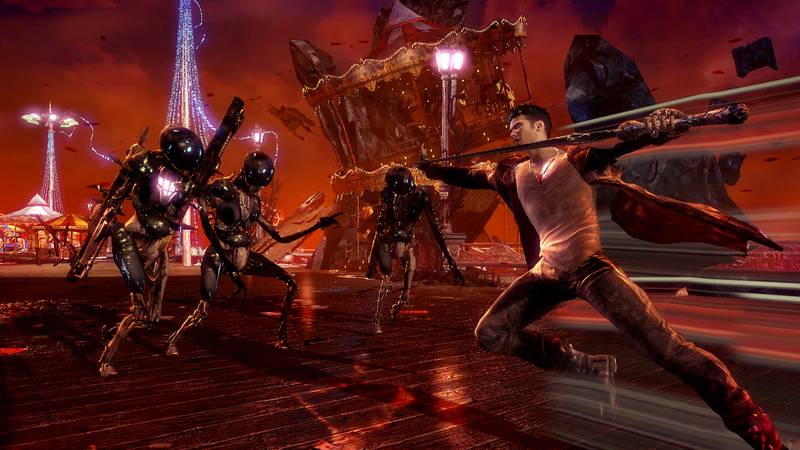 DMC is a 3D beat-em style game with an emphasis on difficulty. Dante has an array of weapons to deal death. There are 5 primary weapons and 3 fire arms at your disposal. Your primary weapon is the iconic Rebellion and plus two angel and demon weapon. Angel weapons are weaker but have huge range and demon weapons are powerful and breaks shields but have short combos. Some areas can only be accessed by breaking walls with certain weapons. Unlike previous games, you will have access to your entire arsenal as you obtain then. Angel and demon weapons can be used by holding the triggers and switching between weapons is done on the D-Pad. When obtained, Devil Trigger will turn the world black and white lifting enemies helplessly in the air as you restore health, become stronger and resistant to damage. Dante’s health, devil trigger, weapons and abilities can all be improved. Health and Devil Trigger are increased by buying cross fragments or earning them in secret mission challenges. As you fight you will earn White Orbs filling your upgrade bar. Each ability cost one upgrade point and all but default abilities can be reallocated. Style points are used to grade players at the end of levels. Your Stylish Meter is a grading system starting from D to SSS each rank increasing the points earned per attack. You can gain style points by using a variety of different moves in a combo and attacking multiple enemies at once. From D to S your meter will not drop that grade below unless an extended period of time passes. SS and SSS drops back to S if you can’t keep you meter high. Dying and using items will affect your final stage score. As the game progresses you will gain abilities that will help you traverse the environment and aid you in combat. Angel Lift pulls you towards objects and enemies and Demon Pull drags objects and enemies closer. Angel boost allows you to dash through the air. There are many platforming segments associated with these skills allowing you to access progress and access secret areas. There are only three difficulties to start more are unlocked when you beat the game and then higher difficulties. The higher difficulties change certain aspects to the levels other than damage. Enemies are replaced with stronger ones early on and some have new skills making them harder to deal with effectively. One mode has Dante and enemies die in one hit and another mode just has Dante die in one hit. You are able to replay levels to improve rankings and finding lost souls secret rooms previously inaccessible. There was this whole thing that I saw about the PC version looking superior to the console versions. While yes it does the game still looks great. What makes the game stand out is the creativity in the level design. Limbo is a place where there are no rules. When Limbo is talking to you it will write itself out taunting you, the world will change right in front of you and you never know what you will see next. I haven’t seen anything quite like this since maybe Psychonauts. Some levels have the worst color choices. One level specifically has a neon red tone while having you fight red enemies making it hard to incoming attacks. The music is composed of a fast paced electronic metal (if that’s a thing) during fights and more gothic music the series is known for in the moment in between. The voice acting is well done expect for some scenes with Vergil. I don’t know what it is but he has these pauses in between sentences not as bad as Shatner’s Captain Kirk but enough that it feels like he’s thinking what he wants to say next. Devil May Cry has been stuck with a couple of tropes that never went away. Dante was always this calm and collected guy rarely showing any emotion beyond his goofy smile. The new Dante is still a wise cracking jackass he’s able to show emotions throughout the game reacting to (most) things realistically. I understand that stoic is a cool character trait but it shouldn’t be the core of the character. The sexuality of the female characters was always a thing and got really out of hand in DMC4. Now, there are three main females, Dante’s mother attractive but mostly seen in paintings and artwork, Lilith a nice body but clearly a monstrosity and Kat who’s dressed fairly conservatively and never put into suggestive situations. While Dante is seen sleeping with women at the start of the game this is more like background about his personality and how he slowly changes throughout the course of the game. Dante is in more suggestive scenes, isn’t that right Kat? These changes make the whole package better I feel and it is thanks to writing from Ninja Theory. If you have played Enslaved then you know what they are capable of. While not on the same level as Enslaved, the writing is the best in the series that even the one liners don’t feel stupid. I liked how the entire game doesn’t take place over the course of a day so the plot can spread its wings. The game is designed to be more accessible to more players. The difficulty is toned down at least from DMC3 the one I played the most. Earning high rankings is completely obtainable with effort because there are less categories involved and the changes to the style points system. The game is still challenging but the difficulty can be alleviated significantly because you can air juggle enemies. A few air combos launch enemies higher allowing you to grapple towards them endlessly safe from most attacks. This doesn’t work against everyone and on harder difficulties certain enemy combinations and one mistake will still ruin your day. Using the triggers for choosing what weapon and or grapple you want isn’t too complicated control-wise. The problem is dealing with fights and platforming. Some enemies are only affected by angel weapons, some demon weapons and some that block most attacks. You’re forced to pick the right weapons because brainless attack stops working. The game tries to confuse you during their platforming segments. You will have to switch between the grapples and the angel boost when traversing bottomless pits. This is a lot to think about on the spot. It can be frustrating if neither is going your way. Personally, I wasn’t very interested in the game either so much so that I skipped the demo. I do have to say that there is nothing to worry about. Development is out of Capcom’s hands who probably would have made bad decisions and end up at square one if they were to handle the reboot. This still feels like a Devil May Cry game with the high levels of actions and difficulty. The writing and the creativity is where the game shines. The entire cast is memorable and changes in the core are welcome. 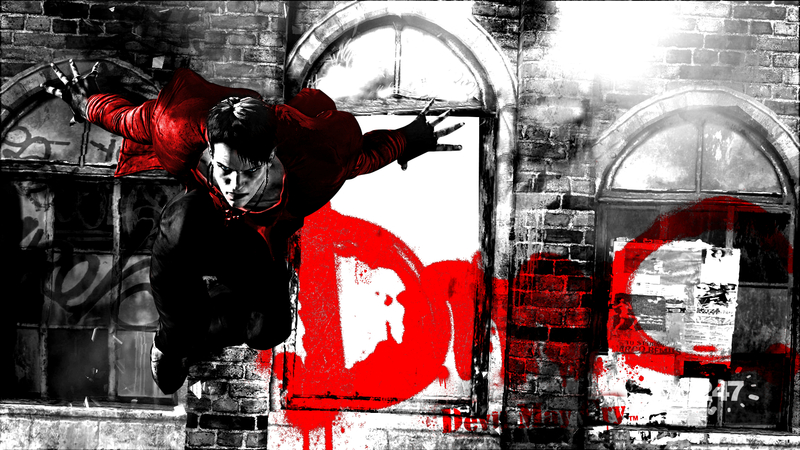 All in all the western developed Devil May Cry is something that works and is something that you won’t be disappointed with.